Having a foosball coffee table in my living room would be like having Super Bowl Sunday every day of the week. Who wouldn't enjoy sneaking in a quick game of table soccer before dinner or between a commercial break? Another really interesting feature of having a foosball coffee table is they all have a glass top to keep your coffee or beer from getting spilled all over the table. However, we don't recommend purchasing a coffee table if you don't already have a full size table. If you are looking for some serious action, please visit our foosball tables section to learn about different tables and features you should look for when shopping for a table. A more elegant centerpiece that has a full bottom shelf for storing magazines and other decorative items. Constructed from solid hardwoods, the coffee table's elegant frame is a stunner in any setting. This table also has a furniture grade playfield with inlaid wood vaneers, octogonal solid hardwood handles, adjustable leg levelers, and solid wood scoring beads. This table is a great way to a great way to kick start some fun in any living space. This an attractive, solid wood coffee table that features a furniture grade playfield with inlaid wood veneers. Telescopic rods easily glide from side to side while octagonal solid hardwood handles allow players to control the hand painted foosball men. Solid wood scoring beads and stainless steel ball returns add to the authenticity of this foosball coffee table. This smaller coffee foosball table is a more affordable route to sprucing up your living room for those spontaneous games before you go out on a Saturday night. 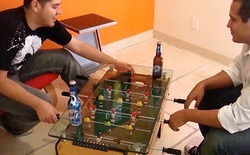 This is the perfect foosball table for playing some foosball drinking games with your friends. It is also small, lightweight and easy to move if you don't want this to be your permanent coffee table. 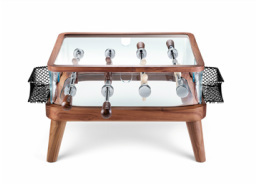 This is the Intervallo, an Italian designed foosball coffee table made by Teckell. It offers the highest quality parts and modern design elements out of any available on the market. Teckell is known for supreme design quality and this model is no different. If you are looking for a stylish living room occasional table, this is the right one for you.